Global Mac sales have significantly outpaced the rest of the PC market, which expanded just 2.3 percent year over year —just more evidence of the iPhone halo effect, according to one analyst. In his latest installment of the "Wolf Bytes" investor note, Needham & Co. analyst Charlie Wolf said that the significant increase in Mac sales in September came in spite of the fact that Apple has refused to enter the inexpensive netbook market that only months ago was booming. Apple made the right decision to stick with its high-end, premium segment, he said. Calling the netbook craze "the implosion of PC prices," Wolf noted that Mac sales did slide in March of 2009 by 0.7 percent, but Apple's share continued to grow as overall PC sales fell 6.7 percent. As both PC and Mac sales turned for the positive through September, Apple has continued to widen the gap, which now sits at 14.1 percentage points. "We have consistently argued that Mac price cuts were a misguided strategy," Wolf said. "Such cuts would not have stimulated much demand because the price elasticity of demand for the Mac —the one differentiated product in a sea of commodities —was simply too low. They would end up decimating Apple's gross margin with little to show for it." That "pricing discipline," as he called it, has led Apple to a worldwide revenue share of about 10 percent, while its market share hovers just north of 4 percent. In the U.S., the revenue share of PC sales for Macs rests above 20 percent, while the unit share is just above 10 percent. Wolf credits continuing Mac expansion to the popularity of the iPhone, which, much like the iPod before it, has created a "halo effect" that encourages consumers to switch to the Mac. Only this time, he said, it seems as though the iPhone is even better at pulling in new users. "We believe that the halo effect emanating from the iPhone should be even stronger than that surrounding the iPod," he said. "After all, the iPod is a relatively simple device while the iPhone is arguably a mini-computer wrapped in a phone's form factor." Wolf has been a proponent of the iPhone halo effect theory for some time. As the iPhone cannibalizes iPod sales, the handset is expected to fill the role once carried by the media player. 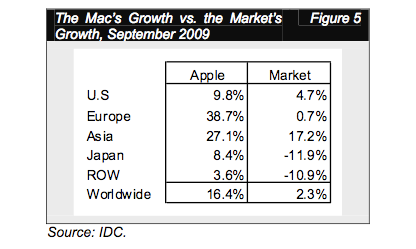 Interestingly, the 16.4 percent growth in Mac sales in September was led overseas. While Mac sales increased 9.8 percent in the U.S., they spiked 38.7 percent in Europe and 27.1 percent in Asia. 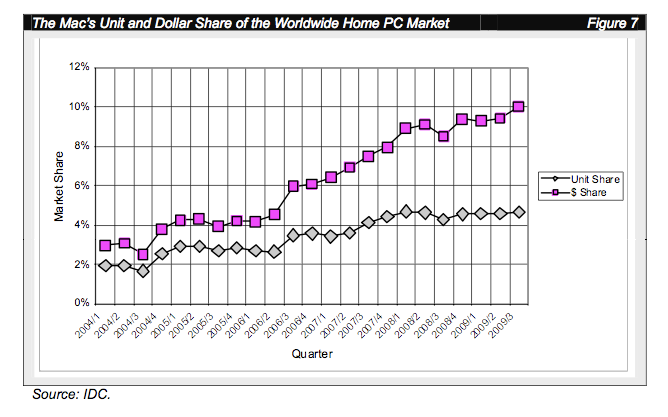 Most of the success of the Mac of late has been thanks to the home market. Apple's home sales grew 28.8 percent worldwide in September, versus only 18.1 percent for the rest of the market. Education sales, too, were strong, growing 15.6 percent, while overall PC sales sagged 2.5 percent in schools. 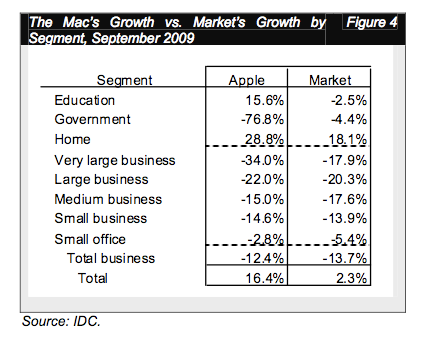 Apple, though, lost 12.4 percent in the business market, and 76.8 percent in government sales. Last quarter, Apple sold a record 3 million Macs along with 7.4 million iPhones, increasing the company's profit more than 46 percent to $1.67 billion. The Mac maker is expected to sell an additional 2.9 million machines this quarter.